Nick Fyntrilakis says that every once in a great while he thinks about what might have happened, career-wise, had he prevailed in that highly controversial race for the 9th Hampden seat in the state House of Representatives in 1999, when he was only 24. “My guess is that I’d probably still be in the State House somewhere, or in some role in government,” he conjectured, while contemplating several possible scenarios that could have played themselves out over the ensuing decade — such as a few terms in the House and then maybe a successful run at the state Senate seat vacated by Brian Lees in 2006 — or some other path. But he didn’t prevail in that race, obviously, losing out in a Democratic primary that wound up being settled in the courts. So he shifted his focus from public service — he had been working as the aide to then-9th District seat holder Dennis Murphy — to an entrepreneurial gambit as a marketing consultant. This started him down an interesting road to a job that could easily be considered public service — although he’s employed by the massive financial-services giant MassMutual. Fyntrilakis now holds the title vice president of Community Responsibility, a post that comes complete with a lengthy job description that includes everything from consideration of the thousands of charitable-funding requests the company receives every year, to representing MassMutual on all manner of issues — and at all kinds of events — involving the city of Springfield. Summing up what he does in that capacity, while also simplifying things greatly, Fyntrilakis said he focuses much of his time and energy on what he calls “issues of the day.” These are in a constant state of flux, and vary in terms of how much of his time and energy they absorb. The list includes everything from helping to set the agenda for a recent visit to Springfield by the new chancellor of UMass Amherst, to ongoing work to revitalize the city’s State Street Corridor, to taking a lead role in determining MassMutual’s eventual contribution ($3 million) to Baystate Health’s $296 million Hospital of the Future. He also chairs DevelopSpringfield, the nonprofit corporation formed in 2008 to advance development and redevelop projects, stimulate economic growth, and expedite the revitalization process within the city. And then, there’s the tornado that roared through Springfield last June 1. It made his already-packed calendar and lengthy to-do list both exponentially more so. It brought a new category of consideration for the company’s philanthropic endeavors (more on that later) and eventually led MassMutual to designate Fyntrilakis as a loaned executive to help oversee recovery efforts along with Gerald Hayes, a vice president at Westfield State University. In that role, Fyntrilakis has provided direction for the Rebuild Springfield initiative — a public-private collaboration involving Develop Springfield and the city’s redevelopment authority — which has undertaken development of a master plan that covers all impacted neighborhoods and the city as a whole. To all of his various initiatives in Springfield, including tornado recovery, Fyntrilakis brings an approach, or philosophy, that he summed up with two words — ‘direct’ and ‘thoughtful’ — and then explained in some detail. “We have real issues here in the community,” he explained. “If you try to tiptoe around things, that’s not real helpful to anyone; we have to be direct in our communications to each other, understand what the issues are, and get to the point on things. Both traits are certainly necessary when confronting what he sees as the biggest long-term issue facing Springfield — improving its education system. 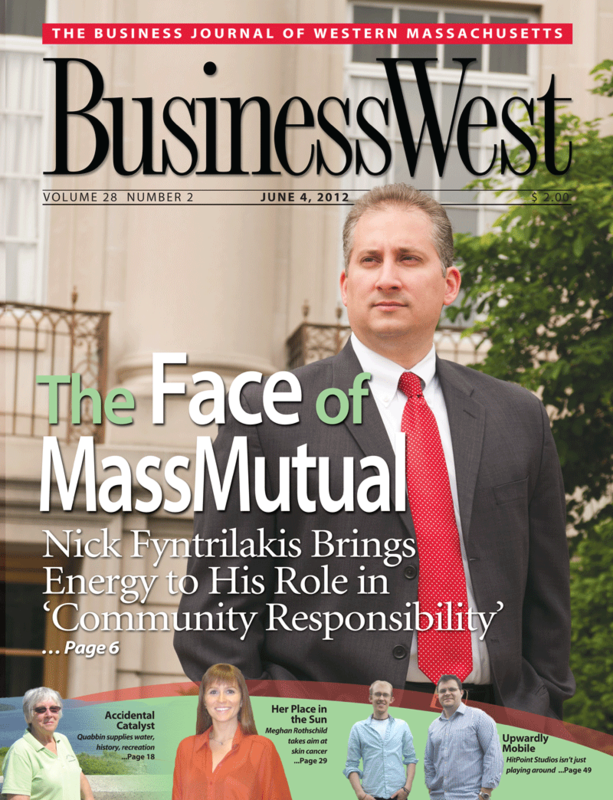 For this issue, BusinessWest talked at length with Fyntrilakis about his broad role and how he approaches it, and also about Springfield and its prospects for the future. Born and raised in the City of Homes, Fyntrilakis remembers taking the bus from his neighborhood in East Springfield to the downtown in the early and mid-’80s. He would visit many of the stores still doing business there then, including Steiger’s and Johnsen’s Bookstore, and eventually reach his father’s small breakfast-and-lunch restaurant on Main Street called Athens. He worked several different jobs there as he got older, while also devoting significant time to listening to what his father and others were saying about the city and its prospects moving forward. This curiosity, or fascination, was blended with a sense of community service instilled by his parents — his mother, who worked at the East Springfield branch of the city library, was one of the first members of the East Springfield Neighborhood Assoc., and both parents were involved in a number of political campaigns — and this mix propelled him toward government service. 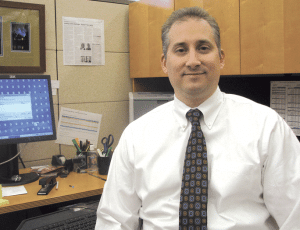 He started as an aide to Murphy in 1996, not long after graduating from UMass Amherst with a double major (Environmental Science and Resource Economics). About a year and a half later, he decided to seek one of the two open seats on the Springfield School Committee. “At that time, unlike today, it was very rare to get open seats that were not heavily contested,” he said, adding that there were eventually 13 candidates in the primary for three seats on the ballot. The field was whittled to six, and he ultimately finished third, joining the board when he was only 23. Fyntrilakis decided to take this knowledge, as well as his love of politics, and seek a much higher office, Murphy’s House seat, in 1999. He eventually lost in the primary to Jack Keough by 32 votes, a number that prompted a complicated recount. The election was eventually thrown out in Hampden Superior Court, but Keough appealed that ruling. Faced with the appellate court’s desire to bring 150 inactive voters to court to verify their registration, Fyntrilakis dropped the case and returned his focus to the School Committee, to which he won another term in 2001. Professionally, he started a consulting business, focusing on public relations and marketing. He did that for three years before winning a job at MassMutual. He started in the Hartford office, where he handled oversight of several education programs and outreach involving Hartford residents. In 2005, he was given the opportunity to lead all educational programs in Springfield and Hartford, among other responsibilities, a career move that required him to step down from the school board. He became an assistant vice president in 2008 and succeeded Ron Copes in the role of director of Community Responsibility, or what had been known previously as Community Relations. He was named a vice president in late April. 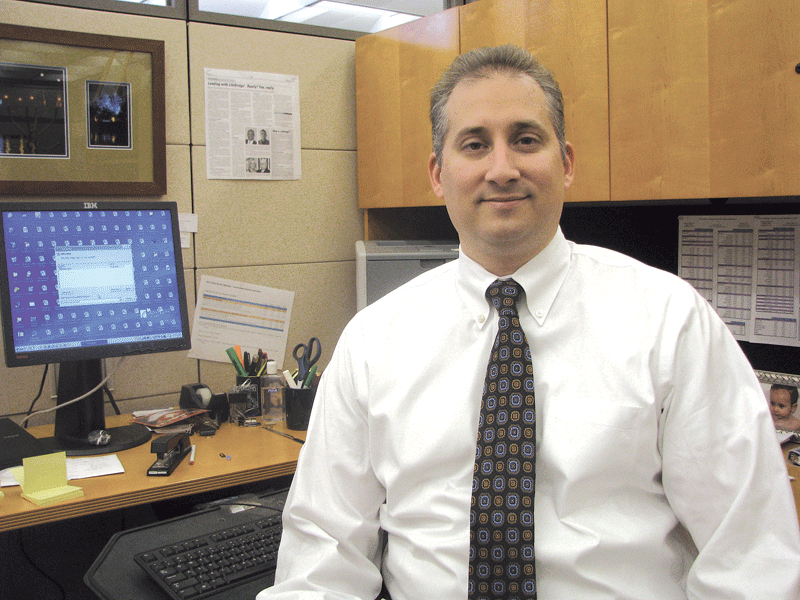 When asked if there’s anything approaching a typical day in this job, Fyntrilakis laughed while shaking his head. There are are a number regular assignments to be handled by him and his staff of nine, such as charitable giving, field programs involving the company’s 5,000 agents, and the LifeBridge free life-insurance program, but then there are those aforementioned issues of the day. He also sits on a number of boards and commissions, from the Springfield Chamber of Commerce to the Springfield Business Improvement District to the United Way. One of the more intriguing components of Fyntrilakis’s job description is overseeing the company’s charitable giving, currently about $7 million per year, and sifting through the more than 1,000 requests, or ‘asks,’ that arrive annually. • The broad realm of economic development, which has been a focus area for only the past five or six years, he said. It includes efforts such as State Street Corridor work, downtown revitalization, and the various initiatives carried out by DevelopSpringfield. The tornado doesn’t fit conveniently into any one category, but in reality, it touches all three, said Fyntrilakis, who noted that Springfield Mayor Domenic Sarno reached out to him just a few days after the tornado struck to take a lead role in the rebuilding effort. Actually, his involvement in tornado-recovery efforts began within hours after the twister carved its half-mile-wide path of destruction through the city. Assessing what’s happened in the year since, Fyntrilakis said the creation of a master plan is an important initial step in the rebuilding process, and the best thing about that document is the level of involvement from city residents. He said the mayor has asked those involved with Rebuild Springfield to use the tornado as a catalyst, not only for restoring damaged areas and encouraging new development, but for city-wide changes in such pressing areas as education, public safety, and job creation — and he believes that the disaster, and the resulting master plan for revitalization, can ultimately become just that, because of that community involvement. When asked about the challenges of working with bureaucracy-laden partners such as City Hall, the School Department, and, in the case of the tornado, state and federal agencies, and also about the enormity of the issues the city is confronting, Fyntrilakis acknowledged that his work can sometimes be trying, but he has the patience and other qualities needed to cope. “Certainly there are days when it feels like you’re trying to boil the ocean, and you wonder how you’re going to get that done,” he explained. “But those aren’t the majority of the days, because if they were the majority, you wouldn’t be doing this for very long. Fyntrilakis said he learned a number of lessons from his predecessor, Copes, about everything from setting priorities for expending time and resources to gaining the all-important momentum needed to achieve progress on pressing issues. “He was certainly a role model for me, and he was very respected in the community,” Fyntrilakis explained. “He knew when to try to push to get things to move in the right direction, and also when not to. As one of the region’s largest employers, MassMutual is looked upon as a resource and potential contributing partner in virtually every endeavor facing Springfield, he said, adding that this simple fact presents one of the company’s biggest challenges — deciding when, where, how, and to what extent to get involved. Which brings him back to the many problems facing the city’s School Department and the need to bring about that radical change he described. As he mentioned, Fyntrilakis doesn’t think often about what might have happened if a few more people had voted for him in the House race back in 1999. He’s very much preoccupied with the present, future, and those innumerable ‘issues of the day’ involving the city he grew up in and remains passionate about. He’s not in public service in a very technical sense, but those two words probably best sum up everything in his lengthy job description — and concisely describe the philosophy he takes with him to work every day.